Sir Jimmy Savile has been accused of sexual abuse against under-age teenage girls in an ITV1 documentary to be shown on Wednesday. Exposure: The Other Side of Jimmy Savile will include several interviews with alleged victims of the DJ and TV presenter, who died last year. Sir Jimmy was never charged with any abuse offences during his lifetime. One complaint was made to Surrey Police in 2007 but following an investigation no further action was taken. Esther Rantzen, who worked as a television presenter at the BBC at the same time Savile was at the height of his fame in the 1970s, said there were rumours about the star. After watching the alleged victims' evidence as part of the documentary, Rantzen said she believed the testimonies and now thinks the rumours were true. "We all blocked our ears to the gossip," she said. "We made him into the Jimmy Savile who was untouchable, who nobody could criticise. "Jim'll Fix It was for children. He was a sort of God-like figure. Everybody knew of the good that Jimmy did and what he did for children. And these children were powerless." Sir Jimmy, who presented shows including Top of the Pops and Jim'll Fix It, died in 2011 at the age of 84. The abuse is alleged to have taken place in a number of places including hospitals, schools and BBC buildings. In a statement, the BBC said no evidence of allegations on its premises had been found. "Whilst the BBC condemns any behaviour of the type alleged in the strongest terms, in the absence of evidence of any kind found at the BBC that corroborates the allegations that have been made it is simply not possible for the corporation to take any further action." In the ITV1 programme, to be broadcast on Wednesday at 2310 BST, former detective Mark Williams-Thomas conducts his own investigation into the allegations. ITV said it had taken into full account the fact Sir Jimmy was not alive to defend the claims. One woman named Fiona, who was 14 at the time, said she was one of several girls from her school who were invited to ride in the presenter's Rolls-Royce. "I knew the moment he asked me to stay in the car with him, I knew what was expected of me. Because I was having this wonderful day out and I was expected to pay for it. And that's what I did. "I now know it was wrong and I can still get very angry about it, but nobody believed me then, so I don't expect anybody to believe me now if I'm honest." Another woman, who remains anonymous, said she met Sir Jimmy at the BBC in 1969, when she was 15. She claims he indecently assaulted her "probably dozens of times". "I think when he was alive I would have been too frightened to have spoken out... there was always that air that he had power and that he had contacts and you wouldn't want to mess with him. So I would never have come out openly about it before." Sue Thompson was a newsroom assistant at BBC Leeds at the time Jimmy Savile was presenting the regional Speakeasy programme in 1978. When asked to help out on the show, she walked into the star's dressing room after a recording and says she was shocked when she saw Sir Jimmy with a young teenager. "I would have said something before if I'd had the courage or conviction that perhaps something would have been done about it. 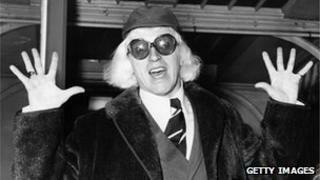 But it has been difficult to speak about it, just because of who Jimmy Savile was," she told the documentary. But Sir Jimmy's niece Amanda McKenna, of Kirkstall, Leeds, told the Yorkshire Evening Post: "The documentary-makers should be ashamed of themselves cashing in on a man who is dead and cannot defend himself." And his nephew, Roger Foster, from Goole in East Yorkshire, said he was concerned the allegations could damage the reputation of charities Sir Jimmy raised funds for. "The guy hasn't been dead for a year yet and they're bringing these stories out," he said. "It could affect his legacy, his charity work, everything. I'm very sad and disgusted." An ITV spokesman said: "This documentary is the result of an in-depth investigation into long-standing allegations of serious and widespread sexual misconduct by Sir Jimmy Savile. "Because of the very serious nature of the claims made by several interviewees in relation to this, particular care and consideration was of course given to the decision to produce and broadcast this programme." For more than six decades, Sir Jimmy was one of Britain's most established showbusiness figures and a leading charity worker. The country's first pop disc jockey, Sir Jimmy was also a seasoned television presenter, marathon runner, Mensa member, wrestler and fund-raiser. He was instantly recognisable in his trademark tracksuit and chunky jewellery.